After 12 hours of research and testing as many kimchi brands as we could get our hands on, we can conclusively say that Tobagi is the best kimchi brand in the United States! With their fresh crunch, deep and full flavor, and throwback to Grandma, Tobagi earned a spot on anyone’s table. If you’ve got rice, make sure there’s some Tobagi close by. The first thing my mother said upon tasting her first piece was, “hey, not bad”. 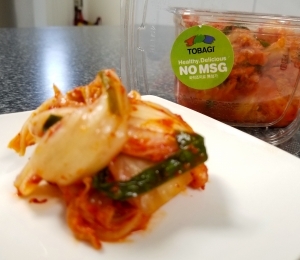 With that ringing endorsement we can confidently say that Tobagi is the best kimchi you can buy in the US. Texturally it isn’t perfect, it is slightly over done, but there’s definitely enough of a crunch that it won’t be an issue. There is a low level of fermentation, which is nice in that it produces a subtle sour, tingly note that supports and brightens the hero here, which is the flavor. Tobagi was the only kimchi to rely heavily on guhchulee (거처리)… I’m pretty sure my spelling is incorrect… on both languages. 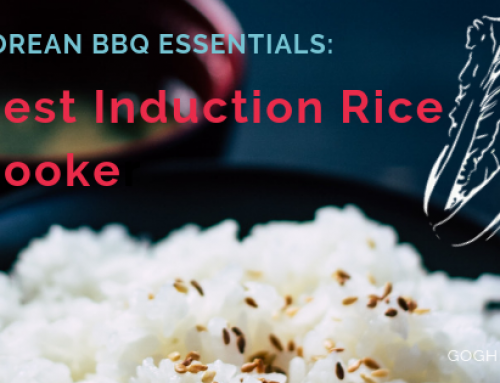 Guhchulee is a seasoning mix that can consist of daikon radish, Korean pear, gochugaru (Korean red pepper flakes), scallions, what have you, and is stuffed between each leaf of cabbage. It is a more time consuming, tedious, and expensive way to make kimchi but the results are undeniable. The overall flavor profile of Tobagi is intense, complex, full, round, and rich; it hits all of the notes that kimchi is supposed to have with confidence. If you are a little unsure of how a kimchi can be described as savory or rich then look no further in your search. 1000 Year Kimchi nails it visually, even the jar and label is a great combination of traditional Korean aesthetic with a more streamlined, modern coat. Coming out of the jar the kimchi looks fresh, crunchy, vibrant, and the colors literally pop out from the plate. 1000 Year is a little on the sweet side compared to the other kimchis, but not distractingly so. Overall, I would have no problem having this on my table, the spicy crunch it provides is delightful enough. However, in the end it was overtaken by Tobagi, which makes even this flavorful kimchi seem a little bland. Unfortunately, Tobagi and 1000 Year Kimchi is probably not easily accessible or available to you (unless you live in New York surrounded by Korean grocery stores like I am). There are a bunch of online options, which as you’ll see later lag behind on the quality side. Seoul Kimchi was a pleasant surprise, made and packaged to order (probably a huge factor in separating themselves from the rest of the online crowd), and if you need some fresh, quality kimchi delivered to your door don’t bother trying anyone else. They do go a little strong on the ginger and it was a little too sour at the tail end of the bite, but it was just so great to realize that this better than decent kimchi was packaged, handled, and shipped, and still came out looking and tasting like we had bought it in a store. Now, it won’t knock your socks off, but for an online kimchi to blend into the crowd of good, jarred, store-bought kimchis is an accomplishment. Chongga is a very popular kimchi brand so I was a little surprised to see it come in fourth. There was nothing really… wrong or bad about it, they do a fairly decent job and the kimchi is “edible” as my mom put it. My mother correctly predicted (we checked the ingredients list after) but they don’t add any sugar. That’s really what is missing here, some sweetness to liven up and bring out the rest of the flavors. 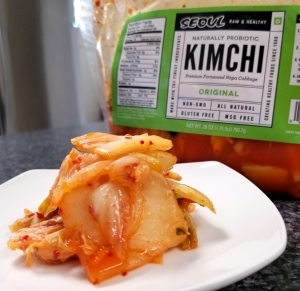 A lot of kimchis use pear, apple, or straight up white sugar and Chongga does have some fructose, but definitely not enough to lift their kimchi above the rest. This was the biggest disappointment and surprise to me out of all of the kimchis we tested. I love Mother in Law’s Kimchi’s labeling and concept but I wouldn’t want anyone to put something like this out and say it was from my mother. They definitely have their fermentation process down, they just need to put their kimchi out for sale earlier then they do. This is sour and funky past what you would even want to make kimchi jjigae with. It is also very spicy, which is fine, but I think it was more the overwhelming sourness that was making me sweat more than the heat. My mother immediately said “out” on her first bite (I kept trying to explain to her that we weren’t eliminating kimchis but she was adamant). Honestly, this one is shame on us, this is really “How Have You Not Done Kimchi Yet?”. I won’t go into the history of kimchi and its importance to Korean culture (all of it would be from Wikipedia anyways), but just like [insert cultural group] and [insert food], kimchi transcends narrow stereotypes and culinary trends. Any food that a group of people has the collective experience of watching their grandma make as children sinks into the very bones and soul of your own cultural identity. Much like tortillas, meatballs, biscuits, schnitzel, what have you, kimchi is much more than a food product, flavor, or condiment. Kimchi is grandma’s house, running around a forest as a kid with your best friend, snuggling under a big blanket on a cold winter’s day; kimchi is warmth, kindness, life, and love. It definitely doesn’t hurt that kimchi is the perfect condiment for when you’re eating mountains of fatty pork, sizzling beef, and rice. I kind of equate this dilemma to students of a language having a better grasp of grammar than the native speakers. Growing up speaking a language you don’t spend too much time thinking about it, you just speak. Same with kimchi, most Koreans and Korean Americans having grown up eating kimchi just know when it’s good or bad. I’ve never actually sat down and parsed through the reasons why and what the specific components were. Almost 90 and still leading the way. If you ask me, great kimchi is when you’re eight years old squatting next to your grandma while she’s making a big batch and periodically takes a big piece of spicy, salty cabbage and drops it into your awaiting mouth… the pat on your cheek after leaving some gochugaru behind helps too. Unfortunately, everyone has their own specific food memories, and those who have never eaten kimchi can’t really rely or draw on them. So we’re looking for an objective evaluation that can apply to everyone and anyone. 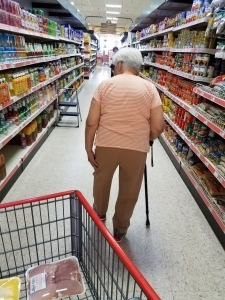 Due to our insecurity in reducing such a universally well known and loved food product to some kind of numerical evaluation we decided to enlist the help of a few heavies… essentially the older folks in our families. They won’t really care or their feelings won’t be hurt by some strangers on the internet disagreeing with their opinions. Fermentation: this is not just how sour the kimchi is (while that is important), the fermentation process leaves a subtle tingly sensation on your tongue that actually adds to the overall ‘freshness’ of the kimchi. So while we do not want the kimchi to be really sour and funky we do need some fermentation to be present for the carbonated, vibrant, tang that is unique to kimchi. Texture: like any good pickle, the crunchier the better. We won’t be evaluating the leafy bits of kimchi as those won’t be crunchy regardless of technique or quality, but more so the thicker, more robust stems of the cabbage. I want a nice level of crispness and crunch, just like how the ‘snap’ of a great hot dog enhances the overall experience. Spiciness: I assume most consumers come to kimchi for the heat, and it is true that kimchi jjigae is considered one of the spiciest dishes in the world, but that’s not all kimchi is. 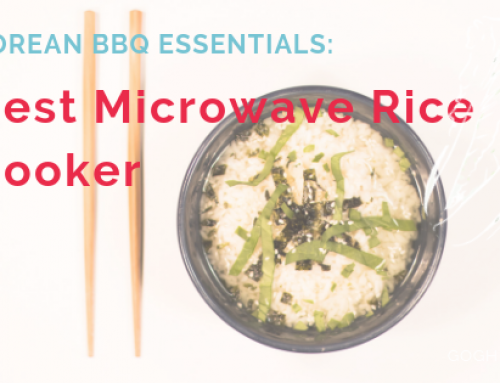 Of course I want some warmth and a good kick, but kimchi is not meant to be eaten alone and it’s not supposed to be the only thing you taste when eating Korean food. Chili peppers actually originated in Mexico and did not reach Korea until well into the 16th century. That means for thousands of years kimchi was made without that trademark heat, only within the past four to five hundred years have the more popular hot versions existed. 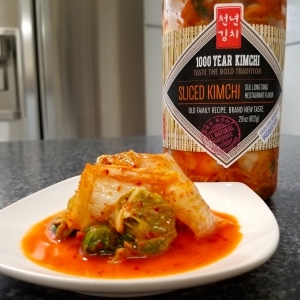 Salty: kimchi is made with a lot of salt, there’s no way to get around it, it’s a huge part of the eventual flavor profile that comes out through the fermentation process. That’s why it takes a lot of skill and experience to produce a great kimchi that isn’t too salty. It’s key that kimchi does not actually taste salty, but that there’s plenty of salinity in there to bring out the complex and subtle flavors. Flavor: obviously much of the above could fall under this umbrella but we want to use flavor here as a catchall for the complexity, richness, full bodied nature of the product aside from the standard spicy and sour dichotomy. Kimchi is so much more than a spicy pickle and this is where the rest of the flavors shine: ginger, garlic, seafood paste (shrimp, oysters, anchovies, etc), apple, pear, etc. 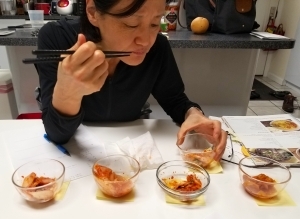 There is a huge need for sweetness and umami to round out the full kimchi experience. 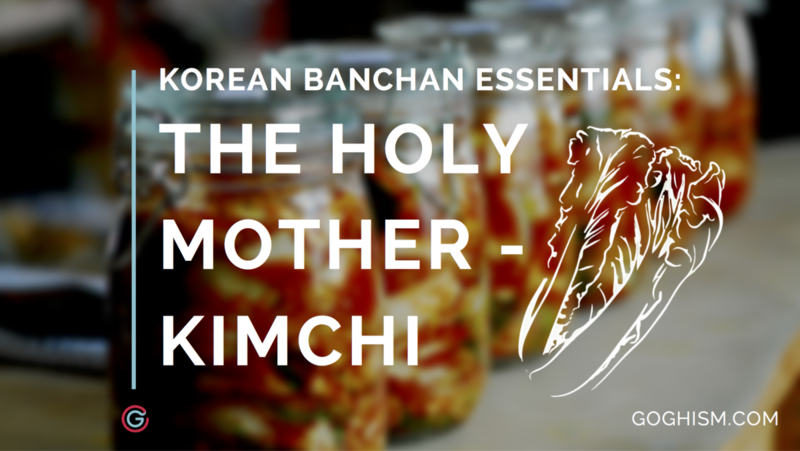 So with those five components in mind we dive into the world of kimchi, let’s see what these kimchi brands have to offer. I promised never to bring canned kimchi into her house again… also please don’t tell her that I posted a picture of her online. As this is our first kimchi post we are going with the basic, standard, ubiquitous Napa cabbage kimchi. There are tons of different uses for kimchi that all depend on different stages of the fermentation process. We decided to go with the table side banchan, which I’m pretty sure is how everyone is introduced to kimchi. My earliest food memory is probably my mother placing an extra cup of water between my brother and I for us to dip our kimchi into (we weren’t used to eating spicy just yet, we were four or five chill out). Similar to why you wouldn’t want to use a freshly made kimchi to make kimchi jjigae (in that scenario you need a much older, much more sour, much funkier kimchi), what you want on your table during dinner is a specific product on its own. 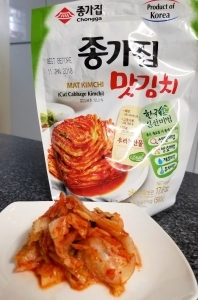 So we’re going with the first and original form of cabbage kimchi, we went through Amazon’s offerings to see what was available online as well as perused the aisles of the many Korean grocery stores in Flushing, NY (where I live at the moment) and grabbed all the kimchi brands we could get our hands on. We started off with a good stable of kimchi brands here, but we definitely need to add more to round out the rest of the competition. We will journey through the treacherous aisles of your local Asian market and get as many jars, packs, bags of kimchi that our fridges will allow. Look forward to more spicy Korean goodness in the days ahead… and I’m not talking about Shin’s hairstyle. It was a lot of fun coming to a product that I’ve grown up and lived with and thinking of it in a completely different way. 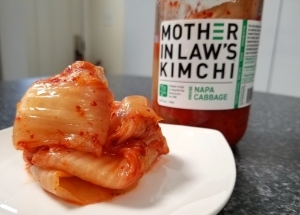 Evaluating and thinking critically about kimchi these past few weeks has deepened my appreciation of the product, verified some of my preconceived notions, and surprised me as well. It’s clear that the results from taking the time to produce a full kimchi (with guhchulee) are hugely impactful and noticeable. 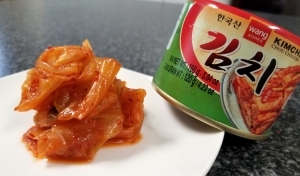 Getting your kimchi from a store is your best bet for a quality product (unless for some ungodly reason it is in a can), and the hurdles of making a kimchi, packaging, and shipping it (while it’s still fermenting!) is extremely difficult. Props to Tobagi for doing things the right way and to Seoul Kimchi for doing their best to make fresh kimchi available to anyone in the US. Couldn’t be happier to have you! Thanks for the review, on the east coast, North Jersey, they have an awesome H-Mart and picked up some Tobagi and since I don’t know much abt purchasing store bought Kimchi this was helpful!! !